The information displayed on the home screen is used by the Data Management System to completely identify you personally and professionally as a member of the United Nurses of Alberta. 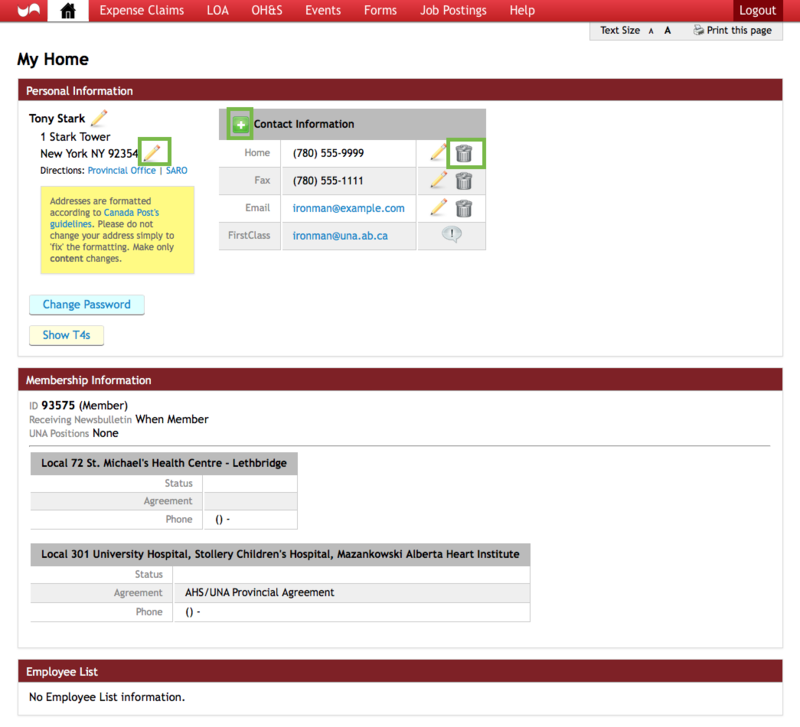 The Home view shows your personal information, membership and Employee information. Navigate with the nine tabs at the top – access to this Home screen, the tools for submitting Expense Claims, LOA for registering/withdrawing, Forms for submitting various requests, Job Postings and Help for accessing tips sheets and defining icons. If you are a Local Executive, you will also see the Local Admin menu, which gives access to local administrative functions. If you are the PRC committee, you will see the PRC menu. If you are the OH&S committee, you will see the OH&S menu. All pages include the Print this page button. Displayed text size is controlled with the small A and large A beside Text Size. The Logout button is visible at all times.